Frequently Asked Questions (FAQ) - SolarVenti Ltd.
Fresh air from outside is sucked / pulled in through a perforated back plate and a 2 mm black layer of felt. The air velocity is so low that only extremely small amounts of dust, pollen etc. are drawn into the system. This dust will eventually dissipate through use. Once the SolarVenti has been installed, there will be visible condensation on the Lexan plastic finishing coat on the inside of the solar air collector at regular intervals. This is quite normal and will in no way damage the system. When the warm air in the solar panel meets the cold air – or at any rate colder air – outside the panel, the condensation will become visible. When two extremes in temperature meet, condensation will appear at the “dewpoint” which, in this case, is on the top Lexan plastic layer of the solar air collector. Therefore, condensation will be most common when the solar air collector starts up after an idle period (short or long) due to cloudy weather. This is when the difference in temperature between the warm air in the panel and the cold air outside will be greatest. You can avoid the visible condensation by switching off the solar air collector for an hour or two depending on the weather conditions. When the panel cools down the condensation will disappear. How does the system dehumidify? Other dehumidification systems have compressors. This one doesn’t. It is correct that the SolarVenti does not contain a power consuming compressor. Instead, the SolarVenti makes use of the phenomenon that the relative humidity is halved each time the air is heated by 11 degrees. So the air is reduced from 80% relative humidity to about 20% when the air is heated by just 22 degrees, thus making it possible for the air to absorb a large amount of extra moisture. It is very important that the moisture-saturated air is blown out before it is cooled down too much. The high airflow from the SolarVenti will see to it. With a slow airflow, the humidity is likely to condensate again further inside the house involving a risk of mould formation. In basements, we at SolarVenti always recommend that an exhaust fan is applied to make sure this does not happen. The system works both summer and winter in many thousands systems worldwide. Please note that many discount systems have very low airflow, which make them quite unfit for dehumidification. The frame and the back plates are made of salt-resistant aluminum. This makes the SolarVenti easy to lift, move and install. Due to its construction, the solar air collector is immune to corrosion – even in an aggressive environment. The “glass plate” is not glass but UV-resistant Lexan (plastic) which has insulating properties and does not splinter if the SolarVenti is dropped during transport for example. The Lexan plate is shockproof and will not even break if you kick a football at it. It is also very easy to replace. The Lexan helps to keep the total weight of the system down. It is much lighter than glass which, by the way, does not insulate very well either. All screws and rivets are made from stainless steel and salt-resistant aluminum. 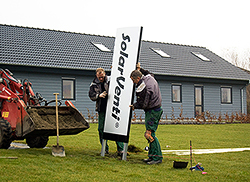 Based on the experience of Danish customers with the early version of the holiday house pack, in which the solar cell was positioned next to the panel, we expect the life expectancy for the solar cell to be 10 – 20 years. This is the most critical component in the panel. The fan is one of the best and quietest on the market – a Sunon with double-row ball bearings and, in theory, 30,000 hours of operation which corresponds to approx. 25 years of wear and tear. It makes it easier to position the system on the wall or roof, and it looks nicer. The solar cell is more protected from hail, branches, footballs, wind and other types of weather when it is built into the panel. This corresponds to the noise from a very quiet extractor fan and we have not yet had any customers who have been bothered by the noise from the SolarVenti. Moreover, the noise level (air flow) can be adjusted using the fan’s regulator. When the fan is turned down the temperature of the injection air should rise. The regulator can reduce the speed of the ventilator (air) and, thus, increase the heat of the air while reducing the noise level. The regulator can also be switched off if you turn it to zero. The on/off switch only has an ON/OFF function. The system should face as close to due South as possible and have as little shade, from trees or other buildings, as possible.. In theory, it is best to mount the system on a roof because the sun goes down at an angle on the west to the horizon. If you mount the panel on the roof, it must be tilted to 60 degrees centigrade in order to catch the winter sun. The pitch also ensures that dirt does not collect on the surface of the panel and snow does not lie on the light-permeable surface. The system is delivered in the form of a do-it-yourself pack in a shock-proof cardboard box. All accessories, such as flexible pipes, vents, valve frames, straps, brackets and screws, are packed in a components box which is packed in the large cardboard box. Additional items –roof kit, insulated ducting etc, are separate items..
What happens when the system blows warm air into the house? The system creates slight excess pressure in the house. This constantly “pushes” the old air out. The air will try to get out where the house is not tightly sealed, e.g. at doors, windows, ceilings and floors. You can send the air in the direction you want using the house’s air escape vents. If you position the air escape vent(s) at the opposite end of the house to the injection air duct, the warm air from the solar air collector will be optimally distributed throughout the whole house. If you wish to adjust, or examine, the effect of the system on the whole house, you can start by closing all vents apart from the air escape vent which is positioned furthest away from the injection air duct. You will then be able to feel (or measure) whether the air reaches the end of the house. If you open the other vents you will get an impression of the effect of the distribution of the warm, dry air. If the piping must be longer than the lead-in through the wall, you should use smooth pipes in order to reduce resistance/pressure loss. Any/all ducting should be outstretched to provide smooth inner walls. Ducting whould be double lined our insulated, preferably R1 or higher. External rigid stormwater with inner duct lining may also be used. In the case of the SV3, 1 to 2 meters of smooth insulated piping is the workable. In the case of the SV7 and SV14, 1 to 4 meters of smooth insulated piping is the workable. In the case of the SV20, 1 to 5 meters of smooth insulated piping is the workable. In the case of the SV30, 1 to 15 meters of smooth insulated piping is the workable. Bends in ducting lines are acceptable, once they are not acute or sharp in which there would be efficiency loss. The air will automatically be drawn to the places where it is easiest to get out, e.g. to vents in kitchens and bathrooms or other vents and openings in the house. If possible, let the air blow directly into the most important room and open the doors to other rooms. One possibility would be to set up a larger solar panel (SV30 is 3 m2). If you ensure that there is an air escape vent at the other end of the house, the air from the SolarVenti will automatically be drawn to it. Another possibility would be to mount, e.g., 2 Solarventi’s on the house, one at each end. Please contact one of our many distributors around the world. See “Dealers & Fitters: World Wide” to see list. All models can be switched off. They all have a built-in on/off switch. A supplementary regulator enables you to adjust air flow and temperature on the larger systems if the people in the building are close to the air injection duct. The small systems can only be adjusted using the air injection vent on the ceiling or the wall. All systems have a switch so that they can be switched off completely. In addition, most of the systems will consistently push in dry air. In hot humid states or conditions, it has been found that users leave the Solarventi on. The low humidity internally creates a cooling effect on the building and occupants, thereby creating a more comfortable environment indoors than outdoors. This may also reduce the need for reliance on air conditioning. Yes, it is easy to extend the system so that it draws hot air out of or cool air into the building. This requires an extra fan on the North or South side of the building and a room thermostat which switches between the fans. You can increase the cooling effect of the extra fan on the South side of the building by drawing the air through a “cooling pipe” (which is buried in the ground) before it is injected into the building. If the system is under one year old, it will often blow in more air than expected. This results in slightly lower temperatures and is due to the fact that the solar cell produces an extraordinary amount of electricity to begin with. After approximately one year, the solar cell’s electricity production will stabilize at the specified level. The fan requires a certain voltage from the solar cell before it can start up. Once it has started it is easier for it to continue. If the sun is weak, for example if it does not directly hit the panel or the sun is behind a cloud, you might hear a low buzzing noise from the fan (which is trying to start). It is difficult to define the best conditions for the system. A small cloud in a clear blue sky can cause more problems than even cloud cover. This is due to the fact that even cloud cover emits a lot of indirect (defused) radiation. NB: Be careful not to put your finger in the fan when it is running. Even though the fan is small it is powerful when it is running – powerful enough to give you a nasty surprise. SolarVenti only runs when the sun is shining. What does this mean? When the sun shines, the air is warmed up and this is what produces the dehumidifying and warming effect. Otherwise, the system would just inject the air from outside directly into the house. Frost and sun often go together. The sun tends to shine on really cold days. On a frosty, clear day almost all of the moisture will lie just above, and very close to, the ground. Therefore, all of the air above this is very dry and suitable for injection into the house. The SolarVenti dehumidifies a house over a period of time. During very cloudy periods nothing will happen. When the sun shines again, the limited amount of damp which has accumulated in the meantime (and which you will probably not even notice) will be extracted relatively quickly. If, for example, you mount an SV14 in a vertical position on the wall of a house, and a large overhang prevents the sun from reaching the upper third of the panel, this will still be alright. The solar cell is in the bottom/lower half of a vertical panel. The shade from the overhang will result in a slightly smaller amount of heat from the solar air collector in the summer, when the sun is high in the sky. However, in the winter, when heat is really needed, the sun will be low and the SV14 panel will not be in the shade. If you mount an SV7 high up on the wall, under the overhang, this will cause problems. The solar air collector will probably remain switched off most of the time. The solar cell is in the middle of the SV7 panel and if it is mounted high up under a large overhang (eaves) the cell will be in the shade for too long. The problem can be solved by mounting the SV7 a little further down the wall. Yes, anyone who is a little talented in the use of ordinary trade tools will be able to install a system. The SV14, which is the largest of the small models, weighs 19 kilos and is light enough for most people to handle. The SV30 is our heaviest model. The solar panel weighs 28 kilos. In this case, two people will be needed if it is to be installed on a roof and it would also be advantage if there were two people involved in the installation of the system on a wall. We believe that the system must have an effect in relation to allergies and asthma. It greatly dehumidifies and has a drying effect, which creates the worst possible conditions for fungus and mould. Also, the air the system blows through the building will usually be very clean. However, the air velocity of the injection air is so low that it would only draw in very small amounts of dust and pollen to the rear of the panel, the fresh air is drawn in through a perforated back plate 2mm of special black felt which is extensively heated by the sun. Many customers have told our installation engineers that they have noticed an improvement in allergic rashes and reduced asthma attacks after the installation of a SolarVenti. In some cases, the symptoms have disappeared altogether. The SV3 takes about 2 hours to mount on a wall. The SV7 takes about 2 hours to mount and the SV14 about 3 hours. The SV20 and SV30 models would take 7 hours. No, if the solar air collector panel and the pipe through the wall are mounted correctly, there will rarely be a draught through the air injection hole when the fan is not working at night.This is due to the built-in “Moisture Stop” that can hold a certain amount of wind pressure. If you completely want to shut the air injection duct under all wind conditions you can get a motor damper that closes hermetically. “A good indoor climate comes from outdoors”: Fresh air is only available from outside; but polluted air also comes from the outside. So, of course, it is possible to draw the smoke from your neighbor’s chimney into your living room but it could also come in through an open window if the wind is blowing the “wrong way”. It is very rare that this occurrence happens. The position of the SolarVenti determines which type of air you will draw into the house. The SolarVenti “breathes” – takes in air – through the multitude of small holes on the panel. If the air intake is placed where the air is normally clean, the injected air will also be clean. In general, the cleanest and driest air will be at the top of the house. In practice, this means that you should not install the SolarVenti close to the ground. You should concentrate on finding a position in which the solar panel can face North and where there is as little pollution as possible from wood-burning stoves, extractor fans etc. Should the indoor air injection duct from an SV 14 solar air collector be mounted on the ceiling, at the top of a wall, in the middle of a wall or at the bottom of a wall? Most people would say that it should be at floor-level. However, it appears that it is irrelevant whether it is on the ceiling or on the top, bottom or middle of the wall. The volume of injected air is of much more importance to the result. Should I use single pipework or ducting for venting? It is always advisable to use insulated ducting whether it is twin lined ducting/pipework (one inside the other) or ‘lagged’ insulated ducting. For long runs from roof to ceiling or to lower ground rooms, we recommend premium insulated foil duct with an ‘R1’ rating or greater. Ensure ducting is outstretched. Vertical ducting runs should be supported. Fans should be moved and positioned to ensure no reverberation occurs. Ducting should not be reduced or squeezed on any part of the run to restrict air flow.